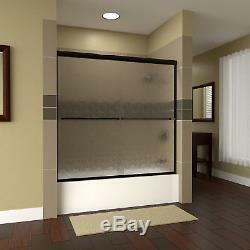 Leter 60"x57.38" Bypass Semi-Frameless Tub Door Clear Glass Anodized Oil Rubbed. Glass Type: Clear Glass, Finish: Anodized Oil Rubbed Bronze. Bypass design allows both doors to glide smoothly across the full opening for ease of entry from either side. Works for showers that have shower heads on the left or right. Lite Euro semi-frameless sliding shower enclosure adds a touch of modern elegance to your bathroom. Safety Glass Type: Tempered Glass. Overall Height - Top to Bottom: 57.38. Overall Width - Side to Side: Maximum: 60. Overall Product Weight: 83 lbs. Overall Width - Side to Side: Minimum: 56. The item "Leter 60x57.38 Bypass Semi-Frameless Tub Door Clear Glass Anodized Oil Rubbed" is in sale since Saturday, August 11, 2018.